I am going to present an interesting fact to you, show you how to remember that fact, and then show you how to use that fact to get really high scoring plays. If there is time, I'll tell you how I got the 20 point per game figure. So perk up - I want your undivided attention for the next two minutes and forty seconds. Each vowel (A, E, I, O, U) makes exactly one two-letter word with X. The words are AX, EX, XI, OX, and XU. Those are the five legal two-letter X words. One per vowel. This essay will do you no good if you don't retain the information when you leave this page, so since I still have two minutes and fifteen seconds of your undivided attention, let's think about the words. First of all, you already know three of them. AX is what you use to chop down trees. EX you've seen as short for your "ex-boyfriend", "ex-fiancee" or "ex-parrot." You may protest that prefixes are illegal. They are. EX also is the way we spell out the name of the letter "X". OX is, of course, the big mammal used to make ox-tail soup. So the COMMON words, AX, EX, and OX, take their vowel at the BEGINNING of the word. What about the other two? XI is a greek letter that looks like this: . 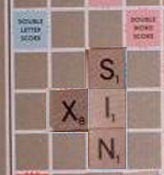 So the UNCOMMON words, XI and XU, take their vowel at the END of the word. spot for a cool 25 points. The BIG play is to lay down TWO tiles, your X and a vowel next to it, in that spot. 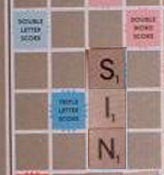 Now we are talking about a play that is worth 36 points (double-letter score) or a whopping 52 points (triple-letter score)! And you can usually do this on the very turn you draw the X! AX so for 52 points! I want to emphasize that this is not a rare possibility. You will draw the letter X in half of your games, and you will be able to make this play more often than not! 1) Each vowel gives a two-letter word with the X: AX, EX, XI, OX and XU. 3) For a nice play, find a vowel on the board next to a bonus square, and place your X on it. Then see if you can take a vowel from your rack and add it to the X as shown above. ...and that's my time. Good luck! P.S. I got the 20 point figure this way: When you have the X, you usually get 36 or 52 points with this play, although sometimes you may only get 17 or 25. I estimate an average of 40 points for the play. Now you only get the X half of the time, giving an expected value of 20 points.